Photographer Camille Seaman is a Shinnecock Indian. She has spent her career illustrating the interconnection of all life. When she was young, her grandfather took her outside to play on a hot summer day. There were no clouds. After a while, she began to perspire. He pointed up at the sky and said, "Look, do you see that? That's part of you up there. That’s your water that helps to make the cloud that becomes the rain that feeds the plants that feeds the animals." In her continued exploration of subjects in nature that have the ability to illustrate the interconnection of all life, she started chasing storms in 2008. She was vacuuming her living room one day when she caught a glance of a show about storm chasers on TV. Her 8 year old daughter said, "Mom, you should do that." Three days later, driving very fast, she found herself stalking a single type of giant cloud called the super cell. This particular type of cloud is capable of producing grapefruit-size hail and spectacular tornadoes, although only two percent actually do. They can grow to be as much as 50 miles wide and reach up to 65,000 feet into the atmosphere. They can become so big that they block all daylight, making it dark and ominous to stand under them. 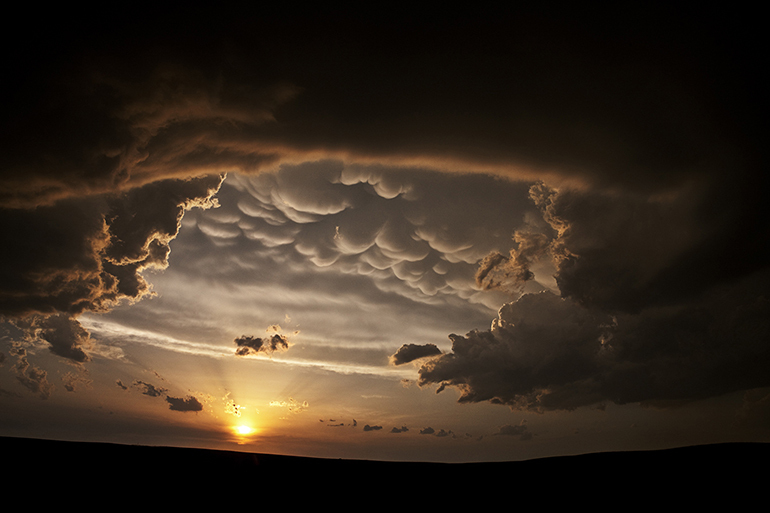 For Camille Seaman, storm chasing is a very tactile experience. "I feel the warm, moist wind blowing at my back, the smell the earth, the sight of the wind blowing through the cornfields, the sweetness of the grass, the smell of the charged particles, the scent of the pavement just before it rains. Then, there are the colors in the clouds, of hail forming, the greens and the turquoise blues." She has learned to respect the lightning. Camille Seaman says, "What really excites me about these storms is their movement, the way they swirl and spin and undulate, with their lava lamp-like mammatus clouds (a cloud formation also known as mammatocumulus, meaning 'mammary cloud'). They become lovely monsters." When she's photographing such amazing clouds, she cannot help but remember her grandfather’s lesson. As she stands under them, she sees not just a cloud, but understands that what she has the privilege of witnessing is the same force, the same process in a small scale version that helped to create our galaxy, our solar system, our sun, and even our very own planet. The results of Camille Seaman's incredible work are featured in her new book, "The Big Cloud." "It's all so beautiful, so awesome, and so humbling at the same time. I always wanted my images to speak to the duality of all things–to speak to the essential truth that there can be beauty in something terrible and vice versa, that there is no creation without destruction."